May The Frost Be With You! I made it to Minnesota! It's been a great first week in the mission field and I've already had lots of awesome experiences here. Just so everyone knows, my usual Prep Days are on Mondays, but this week it was changed to today because of Thanksgiving. ¡Feliz día de gracias! I got off the plane in Minneapolis and was met by the Mission President and his wife, President and Sister Forbes. There were 5 other new missionaries who came in from the Provo missionary training center, but I was the only Spanish speaking greenie. We drove to the mission home in Bloomington, about 20 minutes away. We had a wonderful lunch that finally wasn't a cafeteria meal. Lol! We got a bit of training, met our new companions, and afterward we went right to our assigned areas that evening. 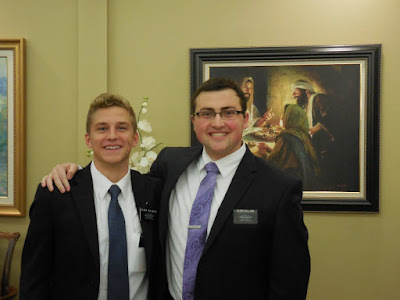 My companion, and trainer for 12 weeks, is named Elder Callans. He's been out on his mission about 11 months now. He's from Washington state and really funny and loves to joke around. He is also very spiritual and knows Spanish really well! 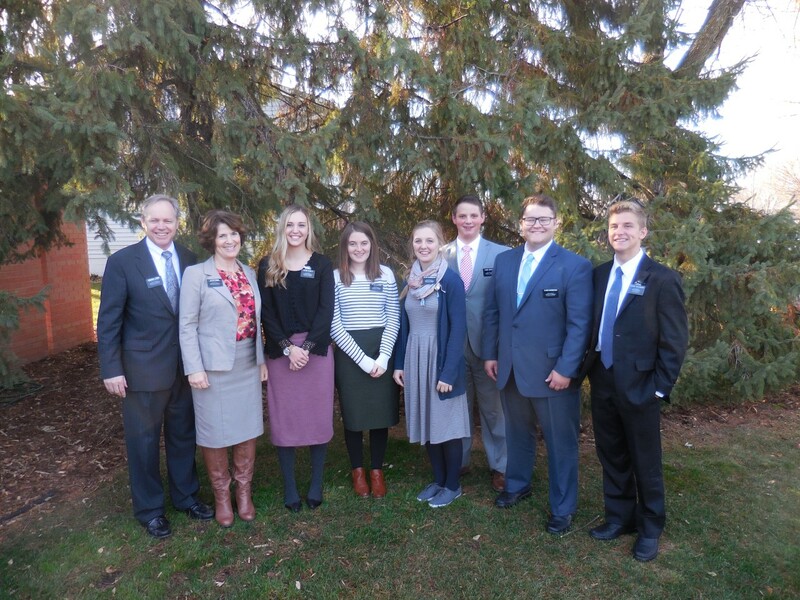 We are serving in the Lakeville, Minnesota area. It's about 15 minutes south of Bloomington, so roughly 30 min away from the Minneapolis-St. Paul area. We actually have about 4 cities we cover - Lakeville, Burnsville, Savage, and Shakopee -and the area is pretty similar in size to Meridian, Idaho. As I arrived in Minnesota, it was a sunny 57 degrees. I guess I made it just in time for winter because the very next day the temperature dropped to 32 degrees and we even got a bit of snow! As we were driving to our area, my companion told me he wanted to stop by an investigator's house before we went to our apartment. I was excited to jump right into teaching! He told me we do some mixed work here so we teach both in Spanish and English. So, we went to teach this 19 year old college student named Remmi in English. He told us he had invited his friend over as well. So we got to their apartment and these guys are pretty wild. We tried to teach them a lesson, but they couldn't sit still. They offered us some quesadillas with whipped cream and green beans and I was like, “What in the world?! ?” haha. They seemed a little drunk and like they wanted to just mess with the missionaries. We tried to just ignore it and go on with our lesson, but a few minutes later they all of a sudden jumped up and grabbed these light sabers and had a light saber fight in their living room. hahaha! I was super confused and thought, “Wow, this is a terrible first lesson.” Then they took their light sabers into another room and jumped out with their name tags on and said, "We're your new zone leaders!!". It was really funny and quite the initiation! hahaha. So my Spanish has been coming along pretty well. It is a bit different than I thought it would be. We actually speak a good amount of “Spanglish” haha. For example, A member family we have dinner with, the Saldañas, speak Spanglish. The dad speaks mostly Spanish but you will occasionally here some random English words thrown in there. And their two girls speak English but understand Spanish. Another mixed family is this less active member named Josué and his son, who is investigating the church, Josué junior. 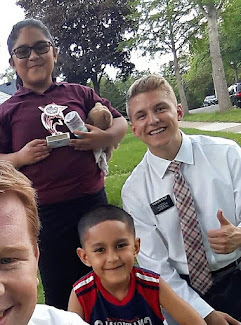 We taught them on Sunday night and it was interesting because they both understand both languages but the dad would speak Spanish and the son would speak English. So we would switch from Spanish to English and back to Spanish every two minutes. But we invited Josué junior, who is 15, to be baptized on January 7th, so that was a really awesome experience! Other investigators have immigrated from different countries, like 19 year old Louis Hernandez from El Salvador who only speaks Spanish. But, overall the Spanish is pretty much like Mexican Spanish. But a lot of the people we talk to in Spanish understand English too so we never know when we are going to use English or Spanish. 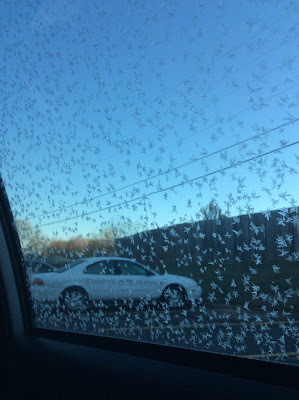 It's pretty cool. Everyone here is very polite and I'm starting to see the "Minnesota-Nice" in people. 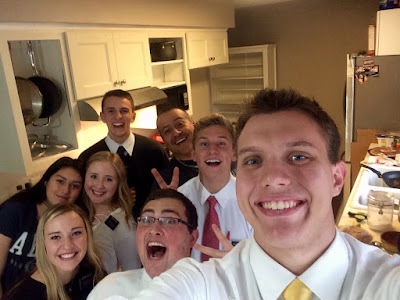 I also am making a lot of great friends with other missionaries in our zone! So for Thanksgiving we had an early turkey dinner with a less active member named Mauricio. 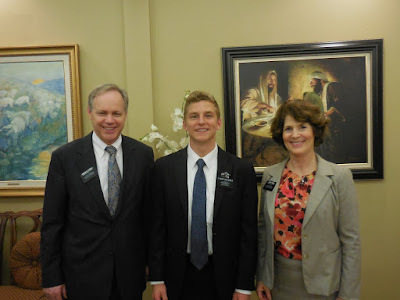 He is an awesome guy and loves to have all the missionaries over and loves to talk about sports! We also have another dinner at 5 this evening, so I am going to be stuffed! I'm grateful for this day we have to remember to always be thankful for everything our Heavenly Father has blessed us with. A message we have been sharing with some of our investigators recently is the message to be thankful for all the little things we have. In addition, not only to give thanks this day, but live every day with thanksgiving in our hearts. As we turn to God in prayer and give thanks for all of our many blessings, we can feel of his love and see his hand in our lives. Something that I am incredibly grateful for is that our Savior, Jesus Christ, the Son of God, atoned for all the sins of the world so that those who come unto him will be healed and cleansed from all their mistakes and pains. I encourage all of you to go throughout this Thanksgiving and upcoming Christmas season with thankfulness in your hearts every day for the loving sacrifice of Jesus Christ. Thank you all so much for the wonderful birthday wishes! I appreciate everyone's love an example to me and I hope everyone has a safe and happy Thanksgiving holiday!